Kenan Thompson has been on SNL since 1993 2003. In his youth, he was in a couple of the best movies of the 90’s, Heavyweights and Mighty Ducks 2. 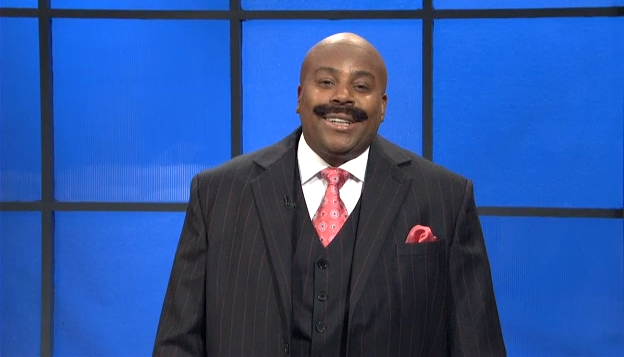 Kenan was a cast member on The Steve Harvey Show which might explain why he does a decent impression of Harvey. Here is the skit from this weekend where he helps a man get over his phobia of horses while explaining to people that his phobia is falling asleep and having his mustache choke him to death. This entry was posted in Actor Mustache, Comedian Steesh, SNL Steesh, Steve Harvey: American Land Mark Steesh and tagged Actor, buttons, cast member, comedy, entertainment, Heavyweights, horses, Humor, impression, Kenan Thompson, Mighty Ducks, mighty ducks 2, Moustache, moustaches, Movie, Movies, mustache, mustaches, phobia, Saturday Night Live, skit, snl, steve harvey, steve harvey show, TV on March 4, 2013 by Los Bulls.